Mutts Rule! 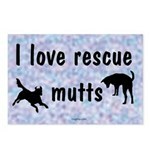 And these mutt and mixed breed dog related mugs, shirts, posters and bags rule too! Do you have a "shrug dog"? You know - they ask what kind of dog you've got and you give it the old shoulder roll? Well, then you know how hard it is to find dog related t-shirts that match your heart. Here is where you can find gifts for person whose favorite kind of dog is the 100% Uhm dog. Yeah you got that right, they ask you what kind of dog and you go "uhmmmm." Of course you can always make something up. I used to call my favorite a "Clown Dog" Can you guess she had a sense of humor? But hey, there is nothing wrong with simply lifting your chin and saying "She's a mixed breed dog". After all, there is no pedigree required to attach to your heart. Check out the DogPlay pages on Mixed Breeds.